Caley Thistle’s Championship campaign is up and running thanks to a hard-earned but narrowly deserved opening day victory at Falkirk. Forward George Oakley struck after just 10 minutes to give the Highlanders an early head start in a league widely considered to be too tough to call. It was not without a scare as Falkirk’s Scott Harrison saw a second half equaliser controversially chalked off for a foul. Inverness won only one of their opening nine matches last season, in a poor start which contributed to them missing out on the promotion play-offs after their form improved later in the season. This opening-day victory shows Caley Jags mean business and it was an impressive response to their painful 5-0 defeat to Hearts the previous weekend. It is now one loss from 17 in all competitions for Inverness, of which 13 have been victories. If John Robertson’s men can maintain that sort of form throughout the entire campaign, title-party plans will soon be afoot. Robertson reshuffled his forward line following last weekend’s defeat at Tynecastle with Nathan Austin and Oakley replacing Jordan White and Aaron Doran in a return to the favoured 4-4-2 system. 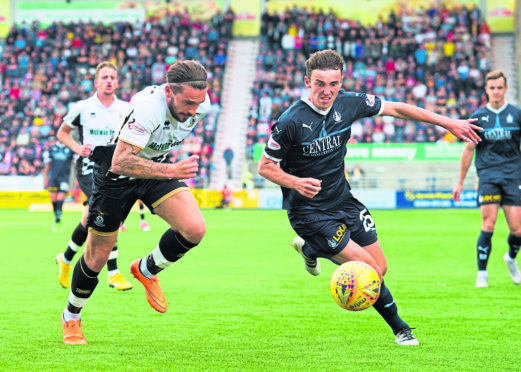 Caley Jags were up against a much-changed Bairns outfit, who have recruited 15 new players, of whom Paul Hartley fielded nine from the start, as he aims to improve on last season’s eighth-place finish. The hosts started brightly but had little to follow it up with in an underwhelming first half display. Their only chance of note arrived within the first minute when Carl Tremarco did enough to prevent Bairns winger Deimantas Petravicius from getting a shot away. Inverness grew into the game and a well-worked move brought about their early opener. Tom Walsh was released down the left flank, with his delightfully weighted cross into the middle providing the assist for the determined Oakley, who showed fine composure to stab home his second goal of the season from 10 yards. The two players nearly combined to the same effect on 27 minutes, shortly after Liam Polworth had blasted a long-range effort well over. Walsh, this time, added height to his delivery, which Englishman Oakley nodded wide. But Inverness were in control. Attacker Austin missed a glorious chance to virtually make the points safe on 54 minutes, as he pounced on a mix-up between Falkirk defenders Harrison and Tom Dallison to go clean through on Leo Fasan but the Italian goalkeeper was out quickly to block his effort. It could have proven a costly miss, as Harrison had the ball in the net just four minutes later after getting his head on the end of Andrew Irving’s free kick. The goal initially appeared to have stood with Falkirk celebrating and Inverness preparing to restart the match before referee Steven MacLean pulled it back for a foul by the summer signing from Hartlepool United. The decision brought about a puzzled reaction from Hartley, who described it as a “perfect goal” having reviewed video footage of the incident immediately after the game. Falkirk had limited offerings in their pursuit of an equaliser thereafter, with Jordan McGhee and Marcus Haber off target with headed efforts. It was Inverness who posed the strongest threat of a clinching goal. Shaun Rooney was first to probe with a header from Liam Polworth’s corner which drifted just wide, while another chance arrived at the feet of Polworth in stoppage time, with the midfielder teed up by debutant substitute Sean Welsh but he shot inches wide. In the end, one goal was enough for Caley Jags and although Caley boss Robertson will have wanted to win by a greater margin he will have been encouraged by the number of chances his side created. Falkirk (4-4-2) – Fasan 6, McGhee 6, Muirhead 6, Dallison 6, Paton 6, Petravicius 6 (Greenwood 73), Lewis 5, Owen-Evans 5 (Mackin 71), Harrison 6, Haber 5, Irving 6. Subs not used – Mutch, Kidd, Sammut, Robson, Turner. Caley Thistle (4-4-2) – Ridgers 6, Rooney 6, Tremarco 6, Chalmers 7, Donaldson 7, Polworth 6, Austin 5 (MacKay 71), Walsh 7 (Welsh 75), Oakley 8 (White 82), Mckay 6, Trafford 7. Subs not used – Hoban, McCart, Doran, Calder.